Our Week 11 PPO breakouts article was a smashing hit, successfully highlighting Melvin Gordon, Orleans Darkwa, Latavius Murray, Larry Fitzgerald, Brandin Cooks, and more. 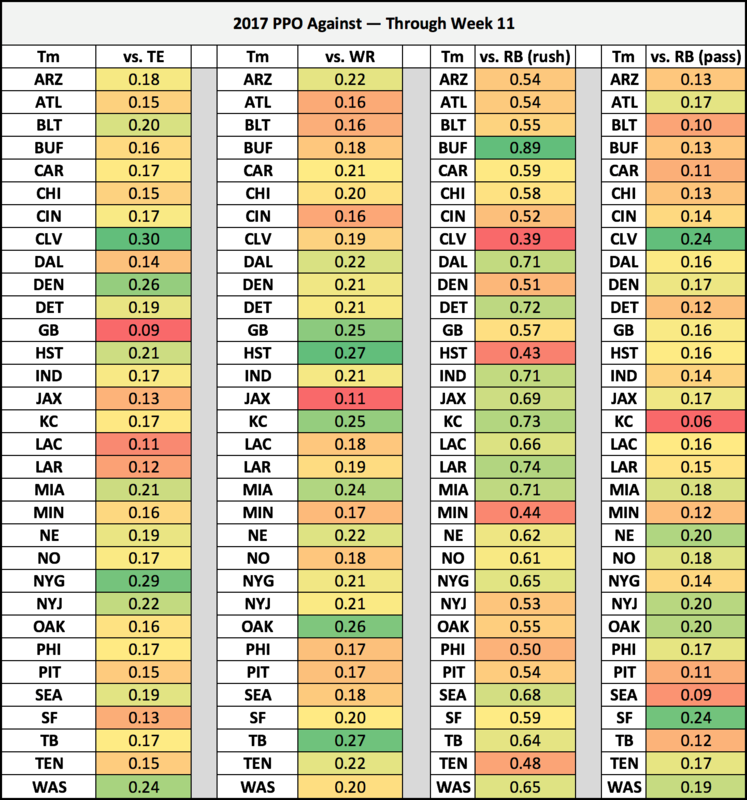 Just more proof that attacking matchups on a per-opportunity basis can be golden for fantasy. Kareem Hunt is primed for his biggest game since September against a Bills squad that has given up a league-high 0.89 fantasy points per opportunity to opposing backs on the year on the ground. Hunt ranks tied for 13th among all running backs with 0.51 PPO this year. Alfred Morris could be a sneaky-good play against the Chargers on Thanksgiving day. Los Angeles ranks bottom-10 in PPO given up to opposing backs this year, and Morris is a good bet for 15-20 touches as a home favorite. Mark Ingram and Alvin Kamara are both going to smash this week — again. The Rams have given up the second-most PPO to opposing backs this year. You can safely ride these hot Saints running backs. I highlighted J.D. McKissic last week, and while he had a good game (in PPR), he didn’t dominate. He’s a lock to have another good game this week, with the potential for more. The 49ers have given up the second-most PPO to opposing backs through the air this year. If you’re looking for the mega Julio Jones game of the year, this could be it. The Buccaneers have given up the second-most fantasy PPO to opposing receivers on the year. Jones ranks fourth among all wideouts with 0.51 PPO this year. So despite the criticism he’s received, he’s still an elite producer on a per-opportunity basis, and now he gets one of the best matchups in this arena. Load up. This is a blowup spot for Demaryius Thomas. The Raiders have given up the third-most fantasy PPO to opposing wideouts this year. Thomas ranks tied forth eighth among receivers with 84 targets on the year, and he has a touchdown in three straight games. I like Brandin Cooks to keep it rolling in Week 12 against the Dolphins, who have given up the sixth-most fantasy PPO to the position on the year. After giving up just two touchdowns to receivers in the first four games of the year, Miami has ceded eight touchdowns to receivers in the last six games. Cooks ranks tied for fourth in the NFL with 786 receiving yards. Jeremy Maclin let me down last week, but he’s in another smash spot against the Texans in Week 12. Houston has given up the most fantasy PPO to opposing wideouts this year. Start Maclin with confidence on Monday night. Vernon Davis is going to dominate the Giants on Thanksgiving night. New York has given up the second-most PPO to tight ends this year. Davis is tied for fifth in PPO among all tight ends who have at least 20 receptions this year. On the flip side of that matchup is Evan Engram. It’s a great matchup for him as well, as the Redskins have given up the fourth-most PPO to the position. Engram’s 72 targets rank second among all tight ends. Assuming he’s activated for Week 12, the now-practicing Greg Olsen is definitely worth a start against the Jets, who have given up fifth-most fantasy PPO to enemy tight ends on the year. This is assuming Olsen won’t be on a snap count. It’s a situation to monitor, but if all goes well, I’m expecting big things. Jared Cook is in a smash spot against the Broncos this week. Denver has given up the third-most fantasy PPO to opposing tight ends on the year. Cook’s 535 yards are fifth-most among tight ends, although he does just have one score. That could change in Week 12, as Denver has given up seven touchdowns to opposing tight ends, third-most in the NFL.